464 pages | 18 B/W Illus. This book rethinks economic theory and calls for a creative and pragmatic approach to policymaking. It examines what development and sustenance of economic progress mean, and how these may be facilitated. The relevance of this issue has received fresh impetus from the significant changes in the degree and pattern of international economic relations that are unfolding across the world, posing both opportunities and challenges. While globalisation of goods and financial markets may have delivered high growth for some nations, the distribution of the benefits has often been highly unequal, with gains to owners of capital and skills being disproportionately higher compared to that of labour, especially the unskilled. Widening and persistent inequalities have been at the heart of rising polarisation and spread of conflicts that threaten the social fabric. This work emphasises the relevance of a broad policy framework based on building individual capabilities and in line with a human-centric perspective. At the same time, it points out the crucial need to create policy space for macroeconomic stability and to accommodate heterodox influences, especially when conventional wisdom proves inadequate, as starkly demonstrated inter alia during the recent global financial crisis. 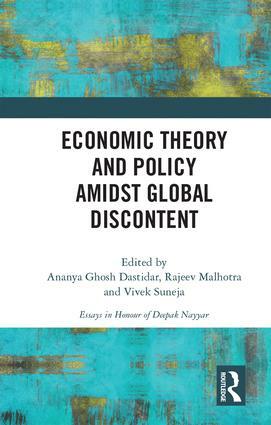 This festschrift, dedicated to Deepak Nayyar, presents chapters on diverse themes that address the persisting global problems of poverty, inequality and sustaining development. The book will be of great interest to scholars and researchers of economics, development studies, public policy and governance, and also to policymakers, government officials and those in media. 6. Economic Policy and Human Rights: Is Globalisation a Meeting Ground? 21. Is Land a Bottleneck for Economic Development in India? Ananya Ghosh Dastidar is Associate Professor in the Department of Business Economics, University of Delhi, South Campus, India. Rajeev Malhotra is Professor at the School of Government and Public Policy and Executive Director, Centre for Development and Finance at O. P. Jindal Global University, Sonipat, Delhi NCR, India. Vivek Suneja is Professor in the Faculty of Management Studies, University of Delhi, India.